I never tried dried beans/legumes before. I always opted for the canned version which seemed much quicker and easier to use. However, since learning that canned foods (with the exception of a few manufacturers) contain BPA (an endocrine-disruptor), I decided to finally give dried peas a try. I found that dried beans and peas are not only more nutritious because they are free from added salt and preservatives, but they are also less expensive. And, it turns out, they are very easy to use. According to the directions on the Goya bag, I just rinsed 1 lb of dry split peas in a colander, transferred them to a glass container, added 3 to 4 cups of water, and then soaked them overnight. In a 6 to 8 quart pot, combine all the ingredients. Bring to a boil. 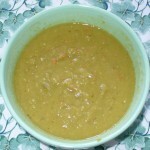 Reduce heat, cover and simmer until peas are tender (around 25 – 30 minutes). That’s it – it couldn’t be easier! If you like a chunky soup, you can enjoy as is. But, if you like a creamier soup, as I do, then using an immersion blender puree the soup to desired consistency. The recipe serves 6 hearty portions. *NOTE: I am not a big fan of onions, so I used just a sprinkling for a little extra flavor, and I chose frozen chopped onions because they cut down on any messy prep and the “onion tears” which I hate! 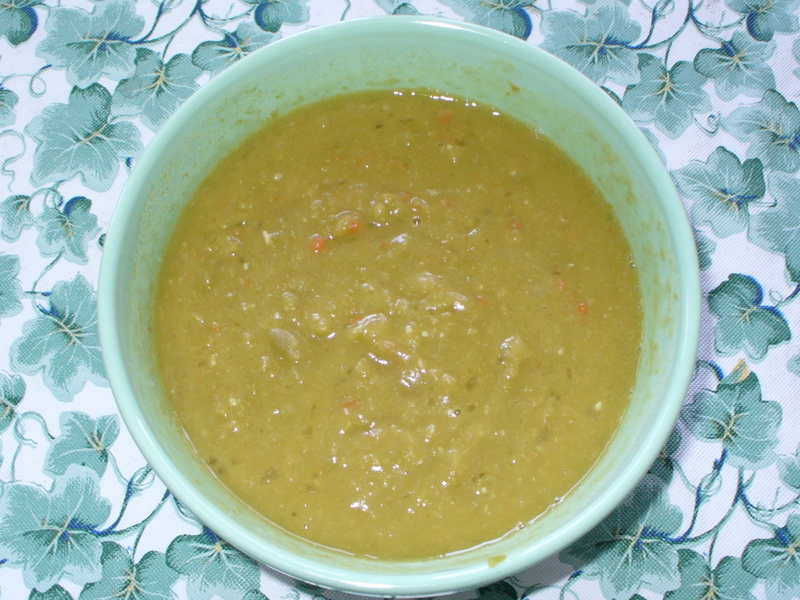 The soup is an excellent source of filling fiber and is a very low cost meal option. If you are craving a bit more flavor, you can added diced ham (the original recipe called for 1/4 lb), but leaving that ingredient out not only saves money, but also lowers the sodium content. I made this with the addition of crushed red pepper, and replaced the onion with fresh chives (chopped) amazing!!! Yum! I love fresh chives. Great idea!